The Daphile is the heart of a digital music system. Its primary focus is in storage and playback of your digital music library. It enables the best possible audio quality and future-proof flexibility by providing plug&play support for USB connected digital-to-analog converters (DAC). You can easily setup a multi-zone system just by connecting another USB DAC for each zone. 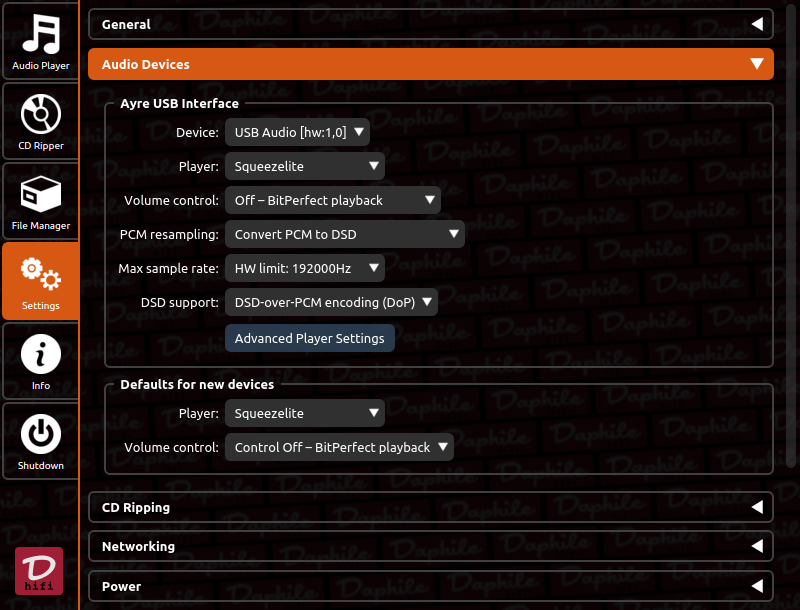 The software solutions of the Daphile are optimized for the best possible audiophile experience. The Daphile supports the most common file formats including high resolution audio. It manages bit-perfect and gapless playback. The networking capabilities of the Daphile are flexible and easy to setup – both wired and wireless. It can even operate in a standalone mode where it provides a wireless access point for the control device. The Daphile can be controlled from any web-enabled device. There also exists the choice of compatible third party control applications for tablets and smart phones. The Daphile operates as a network-attached storage enabling easy music transfer to its internal storage. It is also possible to store audio CDs directly to the internal storage by ripping them with a connected optical drive. 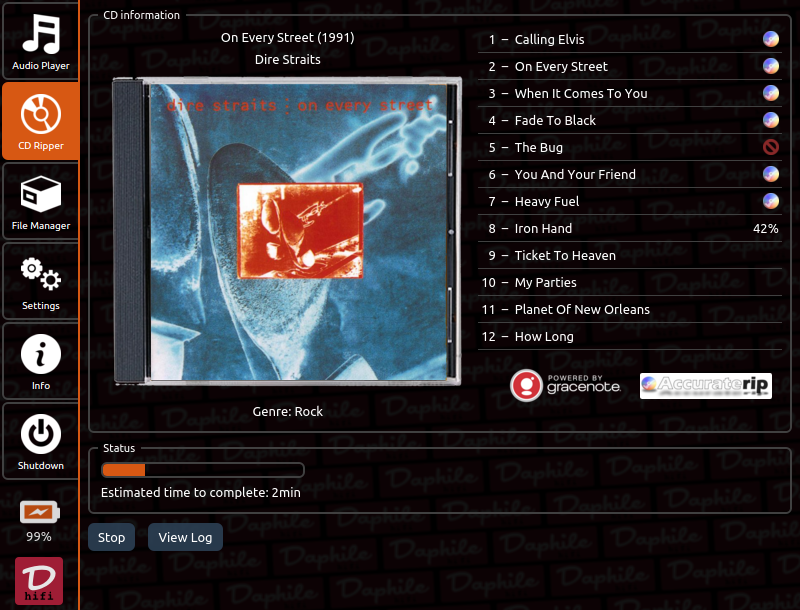 The CD album metadata and cover are automatically fetched from the Internet during the ripping process. 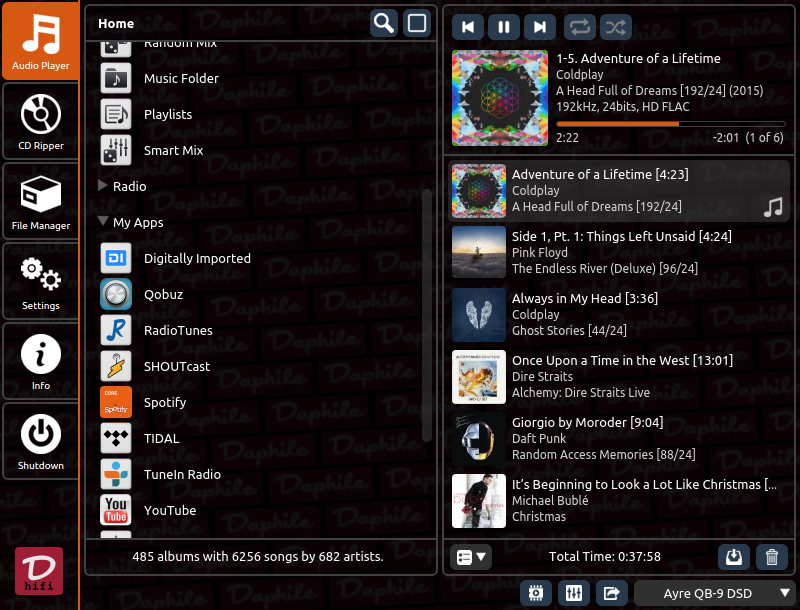 In addition to internal storage the Daphile can play music from various Internet streaming services as well as from external USB-connected and network-attached storage devices. The Daphile is in many ways an extensible, future proof solution. The core software provided by Daphile is user upgradeable via the Internet. 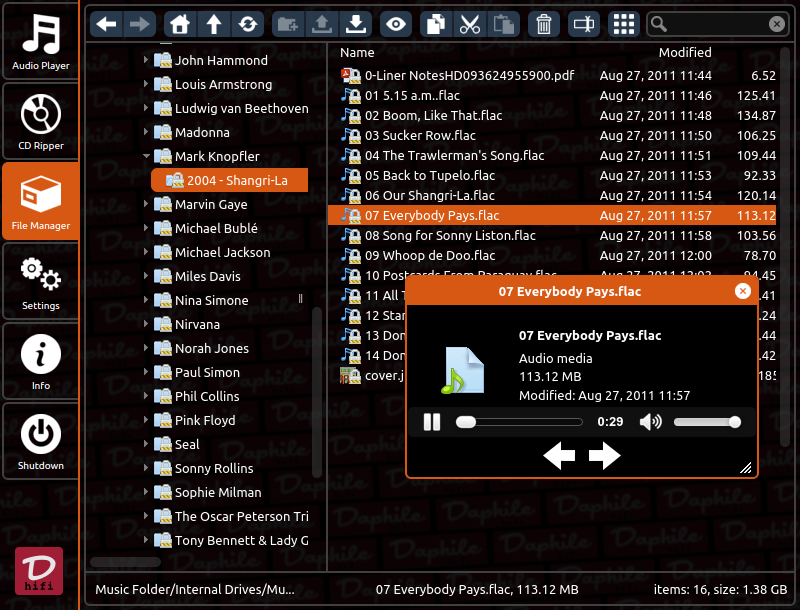 The system functionality can be extended with third party plug-ins. The principal design philosophy for the Daphile has been simplicity and focused functionality to produce a flexible and future proof audiophile component for the era of high resolution digital music. High-end asynchronous USB digital-to-analog converters. The asynchronous USB signal transmission enables improved audio component independence for DAC i.e. digital-to-analog conversion accuracy (including timing) is now fully determined in the domain of DAC. Most of the best DACs in the market are already using USB input. And they are worthy of a good partner to supply the music stream for them – not just a computer equipped with a standard operating system. The Daphile is designed to be the perfect companion for USB DAC. Just plug your USB DAC into the Daphile and start playing – no configuration is needed. 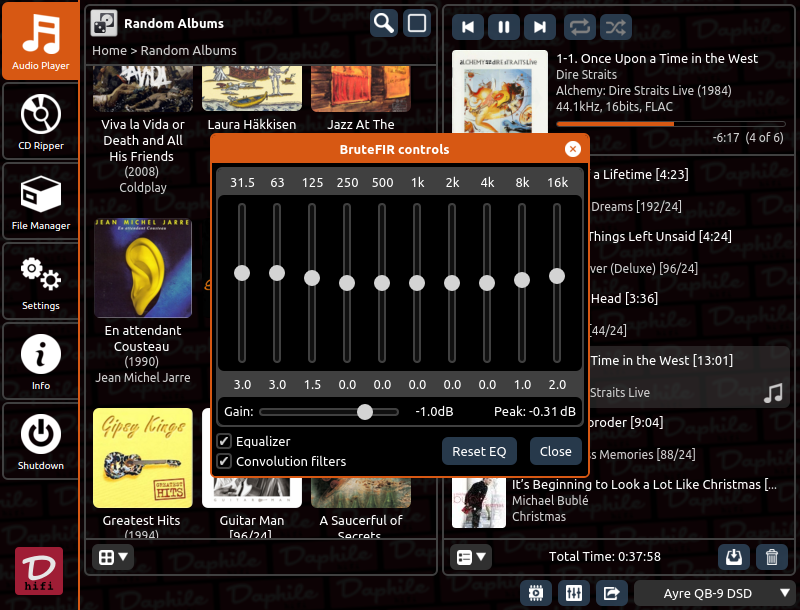 The Daphile has audiophile optimized software solutions for digital music playback and storage. Its main priority is in providing the bit-perfect continuous audio stream for the connected audio devices. The use of the Daphile is simple and requires no expertize. Initial deployment, networking, music storage, CD ripping, DAC setup, multi-zone usage, external storage usage, software upgrade, etc...is just easy. And for the preference of music control you have a number of excellent options. Any feedback is warmly welcomed! © 2013- Daphile. All rights reserved.